The RM5 Evolution is a series of high quality, Italian made electronic coin validators. The RM5T30 model is Top Load/Front Reject mechanism, but can be adapted to Front Load/Front Reject, through the use of an RM5 faceplate. When using the top loading face plate, the RM5 Evolution is completely interchangeable with NRI or C120 coin mechanisms. These units are currently programmed to accept Australian 10c, 20c, 50c, $1 and $2 coins and can recognize 59 coins with up to 59 different values. 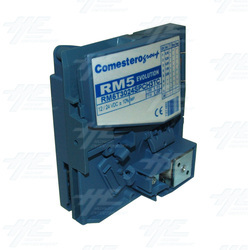 The RM5T30 model validators are widely used as â€˜progressive timersâ€™ for industry applications. They can be used to make automatic payments for any service where cost is determined by time used. The unit features a two exit timer which can manage up to two different types of services. It is suitable for applications such as car washes, tennis courts, showers and internet cafes. To make payment, coins are inserted until a preset value (basic service cost) is reached. A time warning sign is given (basic service time). If more coins are added, the time will increase in proportion to the value of coins added. A connected external display (sold separately) can show the total of coins given, until the basic service cost is reached, and afterwards will show the remaining time in minutes or seconds. Through the use of a portable programmer, it is possible to activate the sum of cashed coins, set service base cost, set minimum cost to add for extra time, determine time unit for calculation and visualization, determine service time, set time warning signs and activate the economizer operations. The RM5 Evolution boasts a number of security features including, an anti-fishing and intrusion devices, a wire cutting blade, and a number of magnetic and optic sensors that recognize coin diameter, mass and material. An automatic sensor system is also in place to compensate for any variation in temperature, tension or light. These units are currently programmed to accept Australian 10c, 20c, 50c, $1 and $2 coins and can recognize 59 coins with up to 59 different values. The RM5T30 model validators are widely used as â€˜progressive timersâ€™ for industry applications. They can be used to make automatic payments for any service where cost is determined by time used. The unit features a two exit timer which can manage up to two different types of services. It is suitable for applications such as car washes, tennis courts, showers and internet cafes. To make payment, coins are inserted until a preset value (basic service cost) is reached. A time warning sign is given (basic service time). If more coins are added, the time will increase in proportion to the value of coins added. A connected external display (sold separately) can show the total of coins given, until the basic service cost is reached, and afterwards will show the remaining time in minutes or seconds. Through the use of a portable programmer, it is possible to activate the sum of cashed coins, set service base cost, set minimum cost to add for extra time, determine time unit for calculation and visualization, determine service time, set time warning signs and activate the economizer operations. The RM5 Evolution boasts a number of security features including, an anti-fishing and intrusion devices, a wire cutting blade, and a number of magnetic and optic sensors that recognize coin diameter, mass and material. An automatic sensor system is also in place to compensate for any variation in temperature, tension or light.